Ayurveda, the traditional medicine of India, shares the distinction with Traditional Chinese Medicine (TCM) and Middle Eastern Unani Tibb Medicine as one of the three oldest surviving comprehensive herbal medicine systems on the planet. 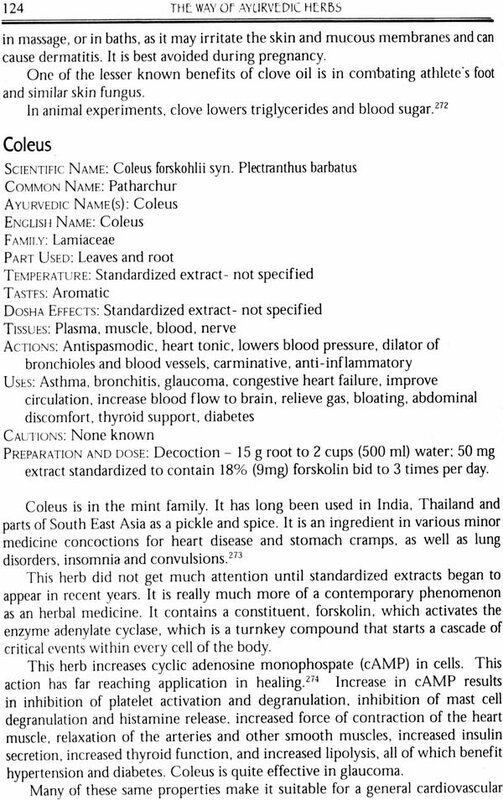 These are distinct insofar as, unlike local or native herbal medical systems, hey evolved over a diverse cultural and geographical area to enable them to treat the most diverse variety of human diseases. Even a cursory examination of the three systems will reveal a number of fundamental similarities, including the energetic classification of diseases and herbs, such as the use of cosmological theories with descriptive energetic medical terms, such as "hot," "cold," "damp," "dry" and "wind." Also, each is based an a similar "elemental" system, which was also the foundation of early Greco- Roman medicine. In fact, there seems to be a common thread that forms the basis of the three great healing systems of the world, with similar approaches to healing, among apparently widespread and disparate cultures, ranging from India, China, to the Mediterranean and even extending to native cultures of the Americas, partially as it result of colonizing and pre—colonizing influences. Could it be that there is a common wellspring of wisdom to all these healing systems? If so, much of it utilized a circular logic to represent our interconnection with all aspects of inner and outer nature. And just as early Asian and European systems used theories of four or five elements to represent an interdependent relationship with all aspects of being, so did Native North American Medicine use the Sacred Medicine Wheel, representing the four directions, north, south, and west, and classified herbs as being heating cooling, moistening or drying, corresponding with their general effects on the sympathetic and parasympathetic nervous system. Having evolved mostly as a self taught herbalist, with periods of intense study in all of these traditional healing methods, I was never satisfied to exclusively align myself to any single one of them. This inspired me to form the concept of Planetary Herbology that subsequently led to the publication of my book with the same title tri Lotus Press. In it, I offer the possibility of a synthesis of essential elements ism each of the primary three medical systems, Indian Ayurvedic, Traditional Chinese Medicine and Western herbalism, applying their medical classifications it; the use of herbs from around the world. This book is the third in "The Way" series beginning with The Way of Herbs and followed by The Way of Chinese Herbs (both published by Pocket books). 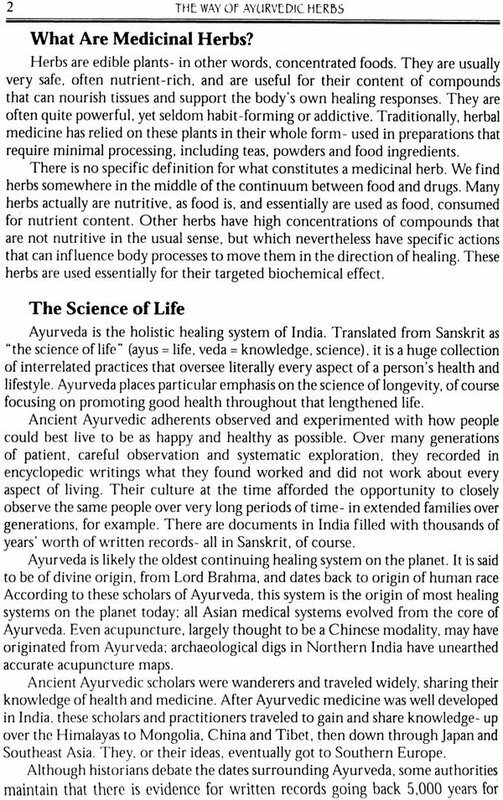 While These were written based on my dominant clinical experience integrating Western and Chinese herbal systems into my practice, this, third one, on Ayurvedic Medicine, is written with my esteemed colleague, K.P. Khalsa, a well respected practitioner of Ayurvedic medicine. Besides our close association as professional colleagues and friends in the American Herbalists Guild (AHG), our background also shares similarities. Independently, we both first learned Ayurvedic medicine from our respective spiritual mentors- myself, with Baba Hari Dass, and for K.P., with Yogi Bhajan. 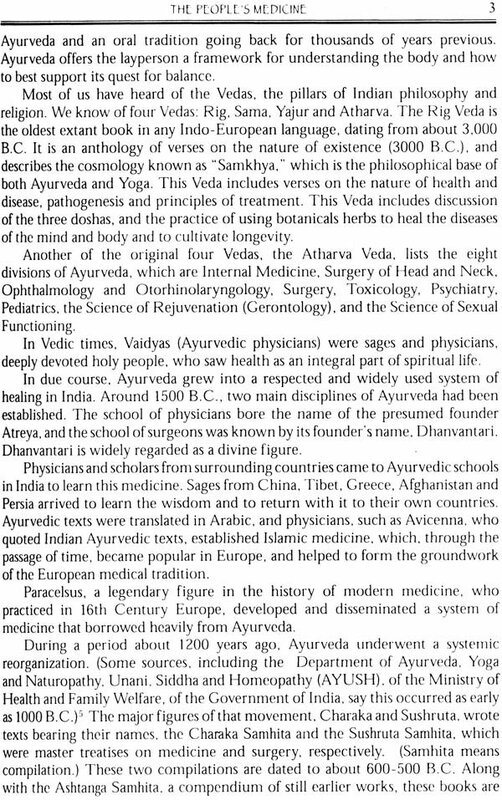 In fact, these two Indian teachers were probably the first to introduce traditional Ayurvedic medicine to North America. It was a fortuitous time finding a reception during those soul searching decades of roughly the l960’s and 70's — a time when the world was living under the ‘cold war` between Russia and the West and the eminent threat of nuclear annihilation, racial upheaval and the Vietnam war. It was a time when many of the values and institutions of the mainstream were being questioned, including Western medicine. Many of us, in the midst of searching for more natural lifestyle alternatives, including older systems of natural healing with homebirth, herbs and acupuncture, also discovered the ancient treasures of healing wisdom from diverse ethnic groups. The reward of those "years of questioning and searching" resulted in learning Traditional Native American Medicine, Chinese Medicine and Indian Ayurvedic medicine. 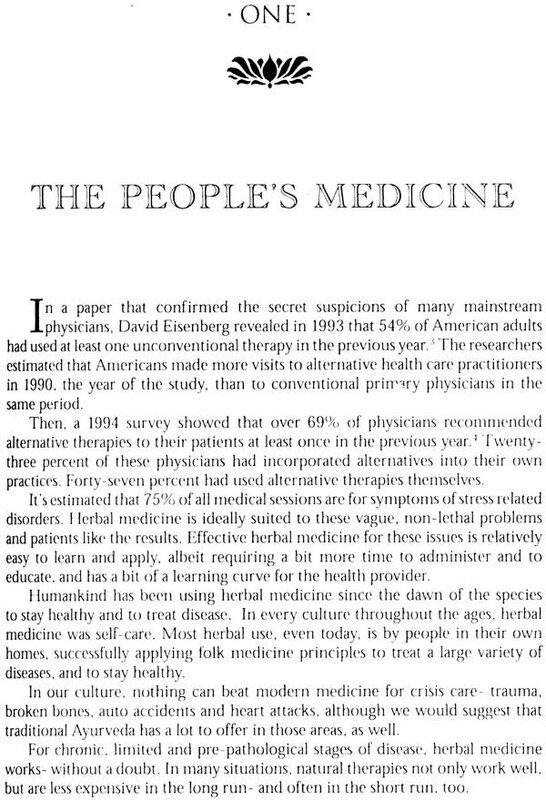 For me, this was reflected not only in the many books which I wrote on herbal medicine, including my East West Herb Course, but also in the line of Planetary Herbal Formulas, which integrate under a single brand name effective herbal remedies from around the world. In fact, Planetary Herbal Formulas was the first to introduce to the North American herbal market such keystone Ayurvedic preparations and herbs as Triphala, Hingashtak, Guggul, Trikatu and Ashwaganda, to name a few. 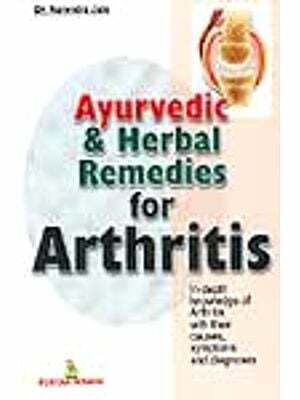 With the growing popularity of Ayurvedic medicine, Planetary Herbal Formulas is now launching an expanded sub line of Ayurvedic herbs and preparations. 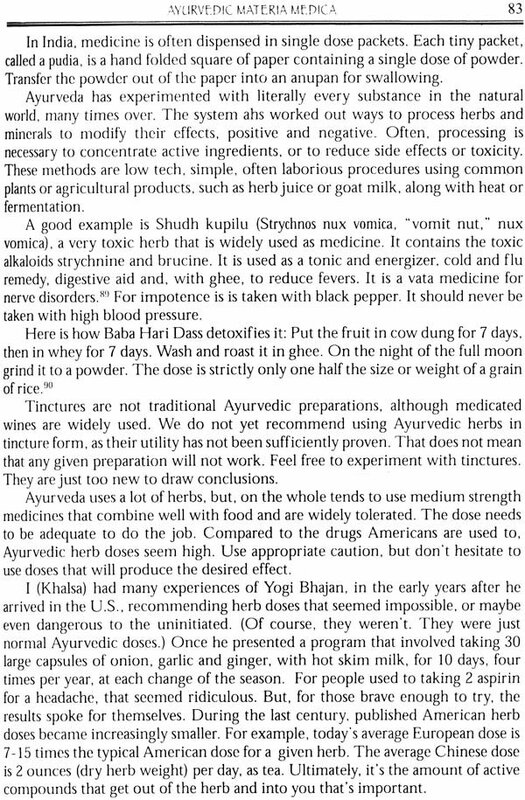 Since 1978, in my clinical practice in Santa Cruz, California, I regularly recommend the therapeutic Ayurvedic diet of mung beans and rice, with certain herbs, together called kichari, prescribe and administer Ayurvedic preparations and therapies including shirodara (head oiling used for psychological disorders), incorporating all in a practice of integrated Western, Chinese and Ayurvedic medicines and acupuncture. 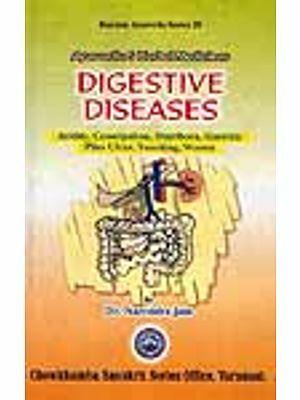 As with the two previous "Way" books, this one offers a good basis for the serious student as well as many simple and practical applications of common Ayurvedic herbs, such as turmeric, ginger, black pepper and many others that are commonly available for the lay person to safety assist in self and family treatment. With the rise of globalization in the 21st century, it is inevitable that these ancient systems of natural healing should rise to the fore. It is also appropriate at this time that The Way of Ayurveda should be written and serve to not only advance the understanding and practice of the earth’s oldest healing system, but by so doing promote its integration into other modalities with the evolution of Planetary Herbology. 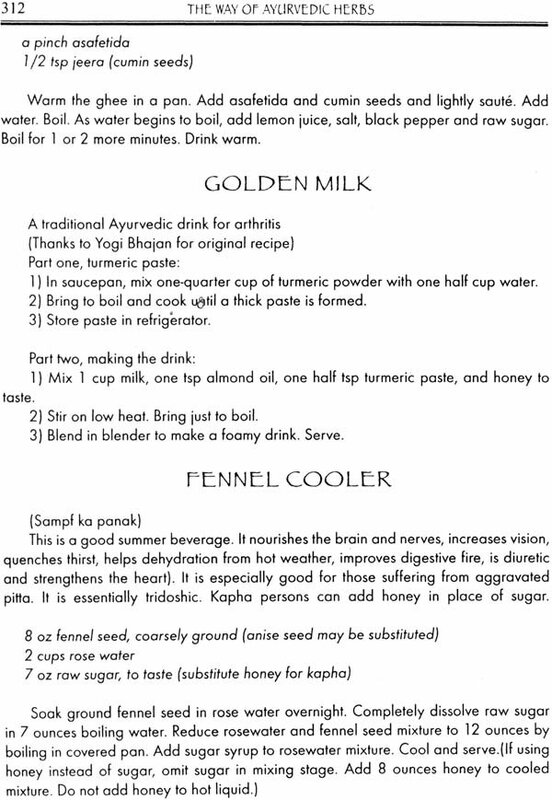 Understanding Ayurvedic herbalism can keep you well. With the knowledge you are about to share, you can achieve balanced health. And balanced health can be u priceless gift. Imagine a time in the near future when you’re free from sickness, when you haven’t been bothered by even a sniff le or a rash for a long, long time. Ayurveda helps that future become a reality. Both authors are living proof of the power of natural medicine. We've seen thousands of patients regain vibrant health, and we’re not alone. An entire new generation of natural medicine therapists is transforming the health care system In America. They are using ancient techniques, from around the world, right alongside modern ones. These are hopeful signs at a time when future health conditions are reported to he harsh. Amid a rising wave of oddball bugs and scary epidemics, resistant to the best of conventional medicine, dread is running high. We are sure you, like other Americans, want to know what you can do to protect yourself- not only against an unknown future of infectious disease, but the degeneration, aging and daily irritations that undermine the quality of our lives. You are likely hungry for answers that offer promise. If the conventional treatments on which you have relied are failing you, there is no better investment you can make in your future than to learn and incorporate practical Ayurveda. In this book, we will make the rich, historically potent herbal traditions of India useful and constructive in an everyday way for everyday people. Michael Tierra, L. Ac., O.M.D., A.H.G., is one of the founders of the North American natural health movement, and was one of the first acupuncturists to be licensed in the United States. He began his herbal and natural healing studies in 1968, while living in a community in the Klamath National Forest in northern California. There he learned the wild forest plants and healing ways of the Karok and Yurok Indians. Starting in 1970, Michael studied and apprenticed with Norma Meiers and Dr. John Christopher in Vancouver, British Columbia, Canada, and began his Chinese medicine and acupuncture studies with Efrem Korngold, Foon Lee Wong and Mariam Lee in San Francisco. Soon his studies channeled into practicing and teaching in San Francisco. Additionally, he began studying Ayurvedic medicine and yoga with Baba Hari Dass, which later precipitated his move to Santa Cruz, California. In 1976, Michael started the first holistic health school in Santa Cruz, The Garden of Sanjivani, where he was the director and teacher in residence. 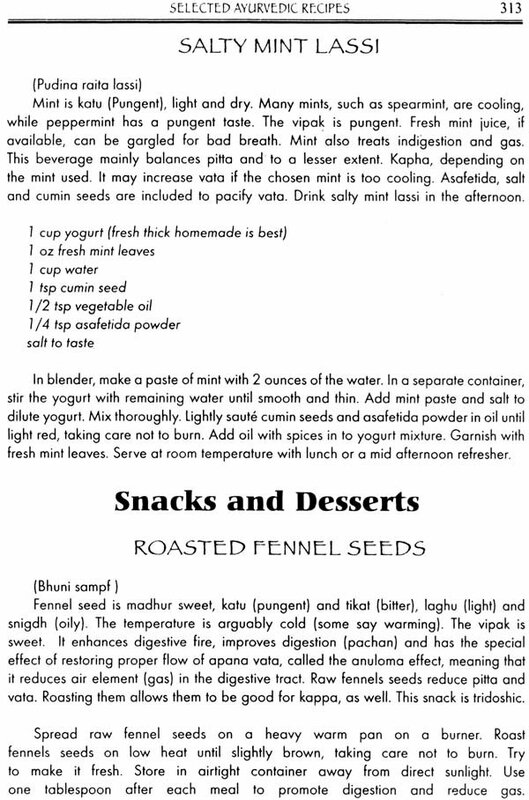 Michael Tierra’s work spread and he began writing for numerous publications and teaching at many schools, including Norma Meiers Herb School in Vancouver, British Columbia, The California School of Herbology, Heartwood College, Esalen Institute, American Herbal Academy, Santa Barbara Center for Holistic Studies, Antioch University and Ojai Institute. Later he authored the nationally acclaimed herbal books, The Way of Herbs, Planetary Herbology, and The Natural Remedy Bible (co-authored with John Lust). His East West Correspondence Courses in Herbology has educated a generation of herbalists. During those times, Michael received his C.A. 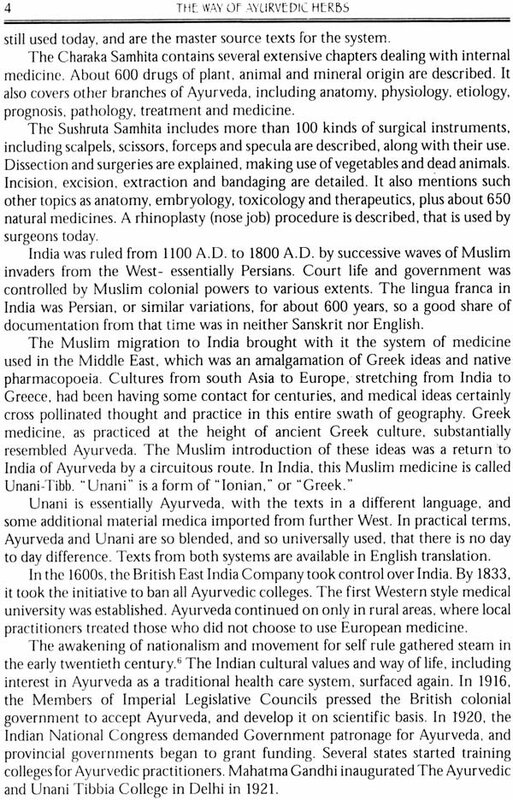 and N.D. credentials, studied Ayurvedic medicine in India for three months and Chinese medicine and herbology in China for one and a half months. At the internationally recognized Herbal Symposium, in 1979, he received a distinguished achievement award as a Master Herbalist from Dr. Christopher. In 1989, Michael Tierra founded the American Herbalists Guild, an organization whose goal is to establish standards for the professional practice of clinical herbal medicine in the United States. He received the degree of Oriental Medical Doctor (O.M.D.) from the San Francisco College of Acupuncture in 1987. Subsequently, he was part of the first group from the United States to study herbal medicine in China. He is co—founder of the American School of Botanical Medicine, and The East West College of Herbalism, which is recognized as an accredited professional herbal college in the United Kingdom. Each year, in the spring, Michael and his wife, Lesley, travel abroad to teach at the East West College. Michael still lectures throughout the world. Karta Purkh Singh Khalsa is an herbalist, nutritionist, yoga teacher and educator. He has been making natural healing approaches palatable to the modern mind for over thirty years. His students find extraordinary benefits and reprieve from a vast range of health concerns by making these principles part of their lives. For the first thirty—two years of his career, he was the herbal apprentice of an Ayurvedic master, Yogi Bhajan. It has been his good fortune to have been involved in the American renaissance of modern herbalism, and particularly the introduction of Eastern ideas, from its beginning in the 1960s. His interest in natural healing techniques developed because, as a child growing up in Oregon, he had a rare, serious disorder, and several serious illnesses. As a young adult, he studied a wide spectrum of physical and mental health care therapies from all over the world, and was successfully healed. He focused especially on Ayurvedic medicine and on the therapeutic value of yoga, meditation, and other studies of consciousness. 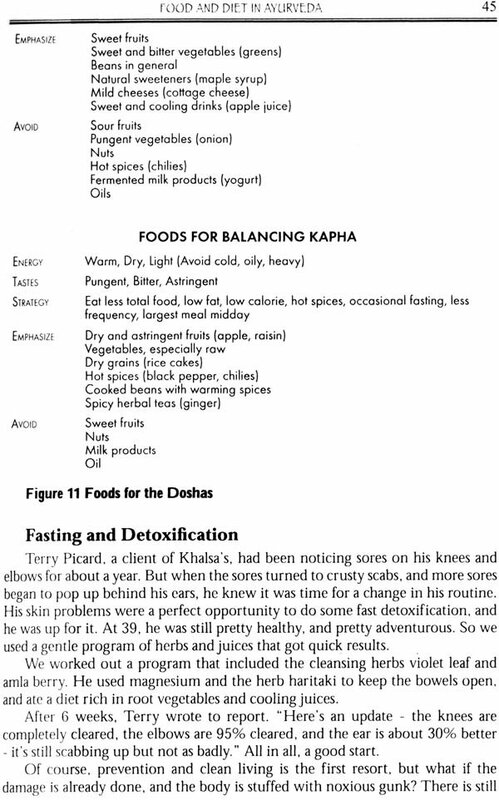 Khalsa is the author, editor or contributor to over 30 books on natural healing topics. He co—authored Herbal Defense (Warner Books), an exciting book for the popular market, on the use of herbs for staying healthy in modern times, and Body Balance (Kensington Publications), a guide to healthy body chemistry. With over 1,000 articles in publication, he is a frequent contributor to mainstream and professional publications in the natural healing field, and is a contributing editor for Let's Live, The Herb Quarterly, Better Nutrition, Herbs for Health and Great Life magazines. Khalsa was the founder of Seattle’s first multidisciplinary holistic clinic. A prominent member of the American Herbalists Guild, he served two terms on its governing council. He founded the first state chapter of the American Herbalists Guild, in Washington, and went on to found a second in New Mexico. Khalsa’s ongoing research and his vast knowledge of herbs from around the globe make him especially valuable to many herb industry businesses that Call on him as an authoritative consultant. He has created over 400 of his own formulations for commercial applications, and works closely with companies that supply high quality herbal products to health professionals across the country. He is on the faculty in the botanical medicine department of Bastyr University, a top naturopathic medical school. He is nationally certified in Therapeutic Massage and Bodywork and is a trainer for national certification in Ayurvedic massage. For over three decades, he has spent his days involved with natural healing, and has observed how well it works with sick people in the real world. He has seen what works to confer long term, vibrant health. He has also seen what does not work. His specialty is making these natural healing concepts palatable to Americans. Karta Purkh Singh and his wife, Jagdish Kaur Khalsa, are long time close students of Yogi Bhajan. Their unique experiences with Yogi Bhajan created a base of knowledge and an approach to life for which they will be forever grateful. It was by the grace of this master that they put their feet on the path of yoga and Ayurveda, and continued on that sacred path for a lifetime. The Khalsas live in Eugene, Oregon, where they share a home with their teenage daughter. They have raised 3 children in Ayurvedic style, and lived to tell about it. 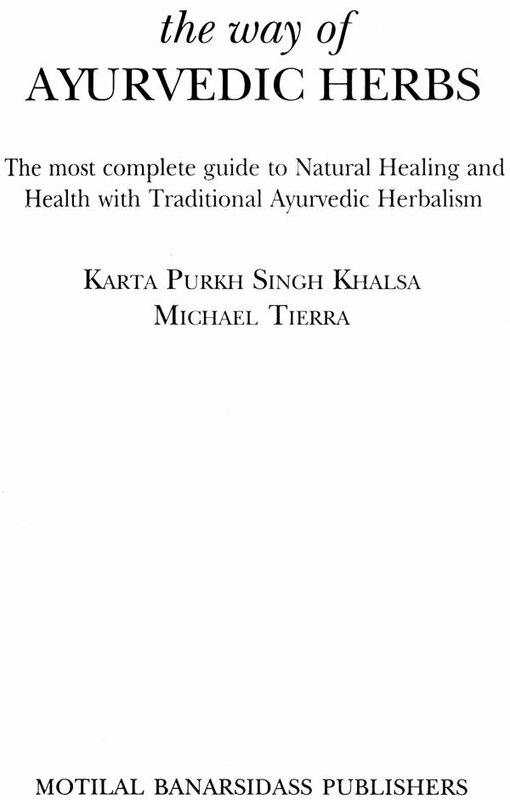 Interestingly, Karta Purkh Singh and Michael were both proficient musicians before taking up herbal medicine. Yogi Bhajan was a dynamic teacher who taught in a traditional way, slowly developing the concepts of yoga and Ayurveda over decades. He was the first to teach Kundalini yoga, a previously secret science, openly in the West. Yogi Bhajan’s teachings inspired thousands. Upon his death, the United States House of Representatives and Senate passed resolutions honoring his life and accomplishments, putting him in the rare company of such luminaries as Mahatma Ghandi and Martin Luther King, Jr.
Yogi Bhajan was active in promoting yoga and Ayurveda to the public. His most famous comment was, "I have not come here to create followers. I have come here to create teachers." He was the inspiration behind several now very successful natural food and medicine companies, including Yogi Tea. Ancient Healing Formulas, Herb Technology, Herbal Gems, Golden Temple Natural Foods and Peace Cereal. Karta Purkh Singh spent thousands of hours over more than thirty years working with Yogi Bhajan to collect his Ayurvedic knowledge. His contributions, begun long before Ayurveda became popular, contributed greatly to the birth of Eastern healing in America. Baba Hari Dass is regarded as a living master and scholar of Ashtanga Yoga, also known as Raja Yoga. This is described as a scientific method of enlightenment first propounded by the ancient sage Patanjali in his Yoga Sutras. It is the Yoga that Baba Hari Dass has practiced since childhood. Since his arrival from India in 1971, Baba Hari Dass has been active in training students and teachers of Yoga in the United States and Canada. Through his compassionate example, young and old alike are learning the gentle art of peace. Baba Hari Dass is a mauni yogi, meaning he has observed for decades the austerity of non—speaking. He teaches through example, writing and discoursing with a small blackboard. As you will read, his aphorisms are potent, pithy and pointed. Baba Hari Dass was one of the first to share the teachings of Ayurveda to Western students. While he always viewed enlightenment, as union with God, as the primary life goal, he also wisely recognized that at least in the early stages of seeking the physical body must be in a state of reasonable repair so as not to represent a distraction in our journey. His teachings embody the union of physical and the spiritual describing the body as a boat to carry one across the river of illusion and before undertaking the journey one needs to attend to repairing the leaks in the boat. This is also reflected in his statement, "The body is the temple of the soul, and the soul is the temple of God." Michael Tierra says, "I was first directed to Baba Hari Dass based on the description that he was a great Himalayan healer. Later I came to appreciate and benefit from his spiritual teachings. Throughout my many years as his student, I carefully recorded numerous healing recipes with herbs and foods that he shared with me personally or with the group of us. 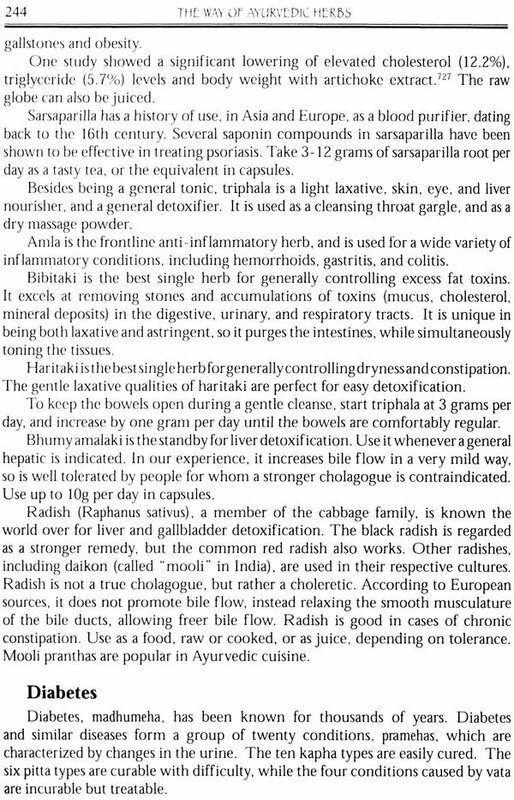 Only later did I or anyone realize that Baba Hari Dass was deeply steeped in Ayurvedic medicine, then unknown in North America. To promote the teachings of Ayurveda in the west, Baba Hari Dass spent many long hours translating its ancient texts on healing into English. Eventually the Mount Madonna Center was founded, in Watsonville, California, dedicated to his teachings, which, since its inception in 1978, included the teaching and practice of Ayurveda. In January of 2006, the Mount Madonna Center has announced the founding of a state accredited Ayurvedic school as part of its offerings. 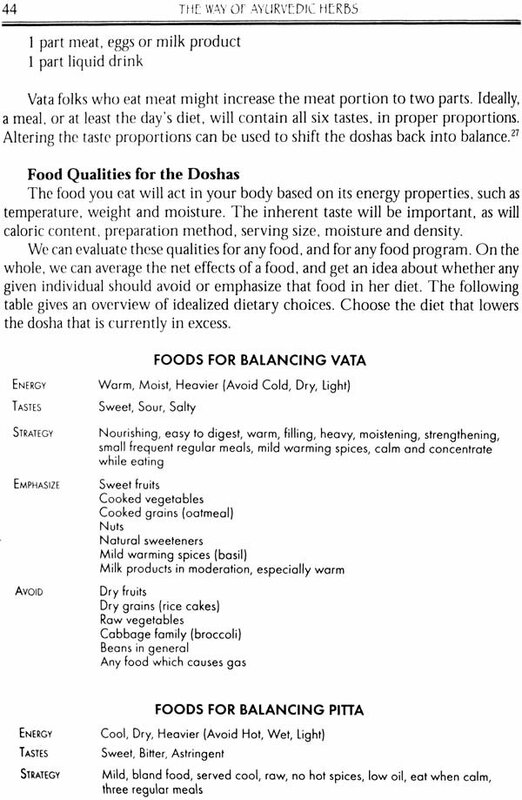 The history of Ayurveda in North America will always owe a debt to the selfless contributions of Baba Hari Dass. Baba Hari Dass’ teachings in this book were imparted in person to Michael Tierra while sitting in person or small groups. Most of the ideas we present here are just common sense. If you had grown up in a culture, such as India, which still has an intact natural healing tradition, you would have been introduced to these ideas on your grandparent’s knee. Growing up with these concepts and seeing the results all around you lets it sink in, so these ideas are not foreign, but beloved rules to live by. Ayurveda is not another intellectual theory, but a set of practical, well developed concepts with their roots in ancient traditions and their flowers in today`s scientific discoveries. Natural medicine and self—care are leading us out of the flawed position that our present thinking and our systems of health care have created. Ayurveda is the ultimate self—care system. Natural healing is all about prevention. The techniques of Ayurvedic self-care are geared toward never allowing you to have a symptom, and if you do, to bringing you back into balance Quickly and effectively, so that you don’t have another. Ayurveda has a different vision of the healthy human- not just the gradually falling, getting through the day human, but a vibrant being with energy to excel. Prepare to explore how we can have that type of radiant good health. 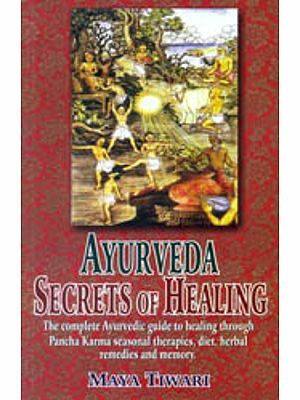 In this practical guide to understanding and using this ancient healing system, we will also take a look at why Americans get sick and stay sick, and how Ayurveda can bring balance and keep them well for life. You may even be shocked at the breadth of knowledge and the extent of simple solutions. How does your body work; how does it heal? What are the proper foods and herbs? Why use them? Why can herbs, foods, and spices heal? How does it all fit together? 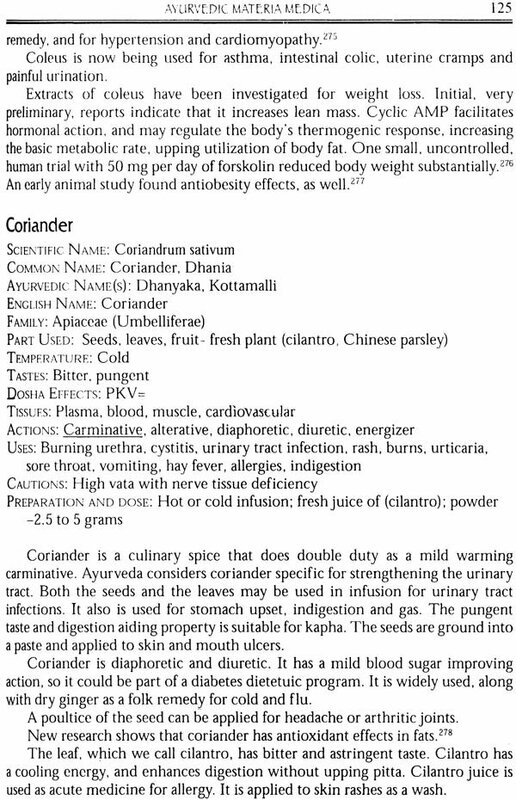 Understanding Ayurveda will put it all in perspective. We’re sure you’ve noticed that there are myriad natural healing theories and methods. And that they all seem to conflict with each other. How could they all be right? They can and they are. But no one regime works for everyone. Individualization is the key. We are born into different bodies, each with a different heritage, and we have all lived different lives. You may have heard of several systems. You may have practiced some. If you gut well, you became a convert. If you didn’t get well, you went on to the next theory. What we really need is a coherent, systematic way of understanding our Individual needs and applying remedies to bring back health and happiness, in a body that works right year after year. Traditional natural healing systems have already worked out this individualized approach. If we dig deep enough, we find them all dipping from the same stream. Ayurveda has worked out the idea that people are different and need to be treated differently. And it has worked out techniques to do just that- successfully. 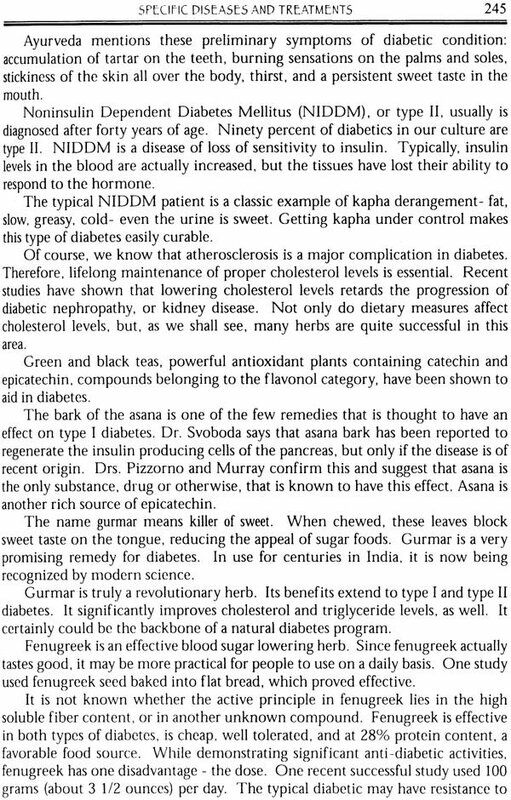 Our research in the area of Ayurvedic medicine convinced us that this was an area that deserved serious attention. It is a coherent, cohesive theory that explains the success of the spectrum of effective health programs. Ayurveda gives us a measuring tool that people can master and apply. It explains the reason some people get better on one diet and others tolerate different foods. The overarching concept of energy balance is the glue that holds all the various theories, systems and techniques together. According to the journal of the American Medical Association, nearly half the people in the United States suffer from at least one chronic illness, and that, taken as a whole, these diseases account for three-fourths of all medical expenses in our country Crisis medicine reflects a crisis-based society. Unhealthy people make unhealthy choices, and create unhealthy environments, which create unhealthy people. Ayurveda helps us find, and stay in, balance? Alternative medicine has begun to achieve some degree of recognition in recent years, yet people are still confused about its basic concepts. Frequently, we speak with interested readers who have read half a dozen books on Ayurveda, and are confused, but still intrigued. Often, after we introduce them to Ayurveda, the light bulb goes off. "This isn’t so obscure and metaphysical after all. I can do this," they say. To quote author Khalsa’s mentor, Yogi Bhajan, "Where’s there’s mystery, there’s no mastery. Where’s there’s mastery, there's no mystery. "How well this applies to natural healing. 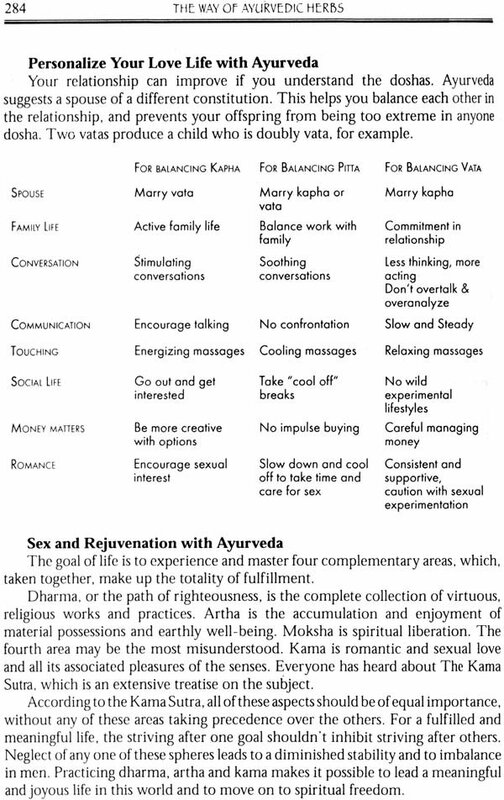 Tierra and Khalsa have spent their entire careers devoting themselves to demystifying these concepts. Ayurveda is systematic, organized, and straightforward to learn. We will put it in perspective. A hundred doctors and healers can tell you that natural medicine is the way of the future and tell you what to do. We have done it (and thousands of our patients have as well). You can do it too and it works. The wealth of information in this book makes sense. We hope it inspires you to action. As we explore together, Ayurveda will get you out of the dark about the issues, bust some myths about diet and herbs in general and present science in everyday language that you can understand. We want to help you pursue optimal health so that it becomes a source of pleasure and energy instead of a problem. You will be able to make balanced foods and medicinal, healing, nourishing herbs a part of your entire life— as an everyday, lifetime tonic for better health, energy, stamina, and strength. You will begin to take steps to live the life you can live not only nourishing your body with the customized, individualized diet based on Ayurvedic principles, but also building on that foundation by using herbs, foods and teas to heal illness, soothe injury, and tip the odds against disease and degeneration in your favor. The Ayurvedic perspective can be seamlessly integrated into your life. If you are of the people such as the mothers who believe that "all babies just get ear infections“; sinus sufferers who assume antibiotics and surgery are their only options; the arthritic, the allergic, the addicted who have been told there is no hope for their conditions, you are in for a great surprise. Ever wonder if your skin rash, hemorrhoids, diarrhea, balding head and weak eyesight are connected? Ayurveda will give you the tools to reverse all of these and more with a new perspective on your life. Armed with the knowledge of how you are put together as an individual, you will be able to select your diet, know which herbs to take and what style of massage to have- even what temperature to keep your office. 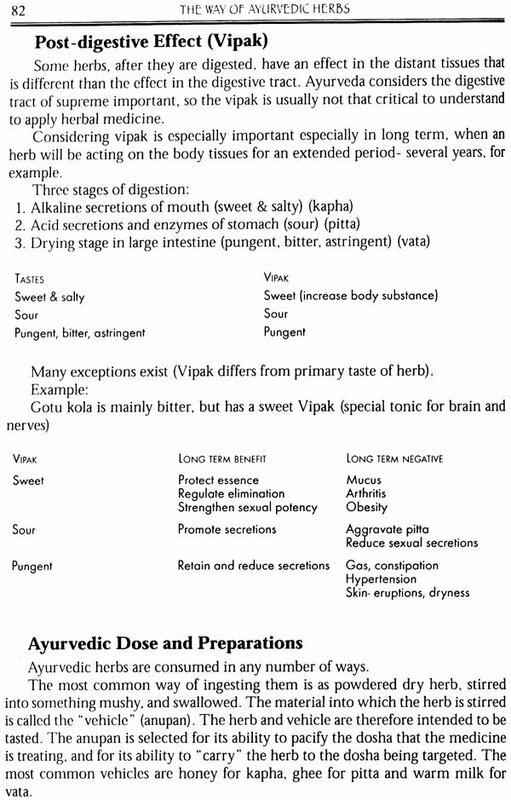 Ayurveda is systematic and user friendly. You will find the methods in this book easy to understand and logical to apply. 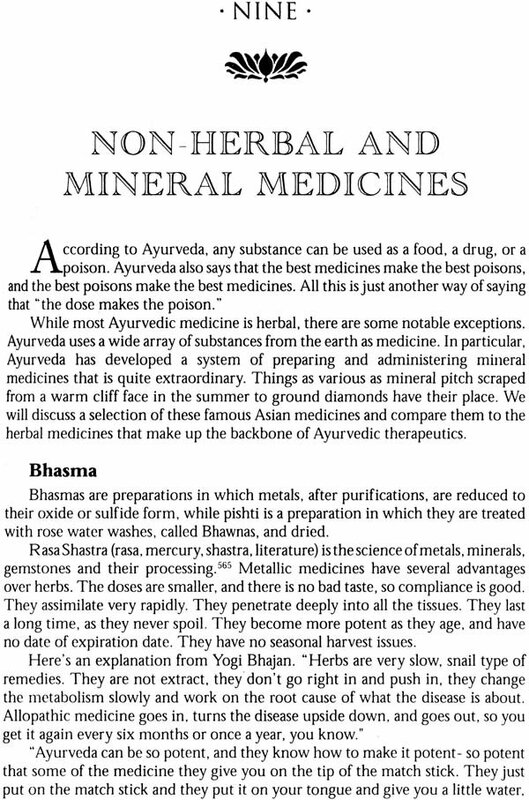 As we proceed, Ayurveda will come through as systematic, consistent and eminently useful. There’s much to learn- and it can be easy, fun and most importantly, effective beyond even what you might imagine. You will become more deeply committed to your health - and will have powerful new tools with which to do something about it. The Way of Ayurvedic Herbs will help Americans change the way they see health, disease, medicine and healing- and tangibly impact what they can do about it day to day. People of ancient cultures experienced the natural world in which they lived, and sought to develop a way to systematically understand their relationship to it. They reasoned that they were made of the same stuff as the rest of the natural world, and were subject to the effects of circumstances in their living environment. In culture after culture, often widely separated by distance and time, people came to remarkably similar conclusions about how their bodies responded to changes in the climate, diet, season of the year, and so forth. Practitioners in these cultures put together systematic metaphors for how herbs, food and exercise interact with the body and mind, based on centuries of patient observations of their patients. Gradually a consensus emerged. Fundamentally, these experts concluded that "like increases like." In other words, an external factor, when introduced to the body, will create a similar reaction in the body of the person experiencing the change. For example, going out into the cold weather will make the body cold. Eating heavy food will make the body heavy. This seems obvious on the surface, and it is ultimately pretty easy to grasp intuitively, but putting together all the intricacies of every possible effect of every possible herbal medicine on every possible person is a daunting task. If we think of each of these possible effects, such as temperature or moisture, as an energy, we can put together a conceptual scheme that will explain the complexity of what it is to be a human being, while being consistent and systematic enough for people to learn and apply in daily life. The cumulative effect of these Internal and external factors forms a complex metaphor that we call "energetics This metaphor creates a conceptual model that is intricate enough to represent an entire human being, yet simple enough to be useful. Energetic evaluation of the body is based on experiencing the body with the human senses. Since everyone experiences the world in subtly different ways, it takes centuries for a consensus to develop among practitioners about any given therapeutic procedure or remedy. It creates a structure in which remedies can easily be identified and understood. According to energetic systems, the sum total of the effect of a diet or supplement is what counts. For example, we may know from modern science that an herb contains antibacterial activity. We want to give that herb to treat an acute bacterial infection. 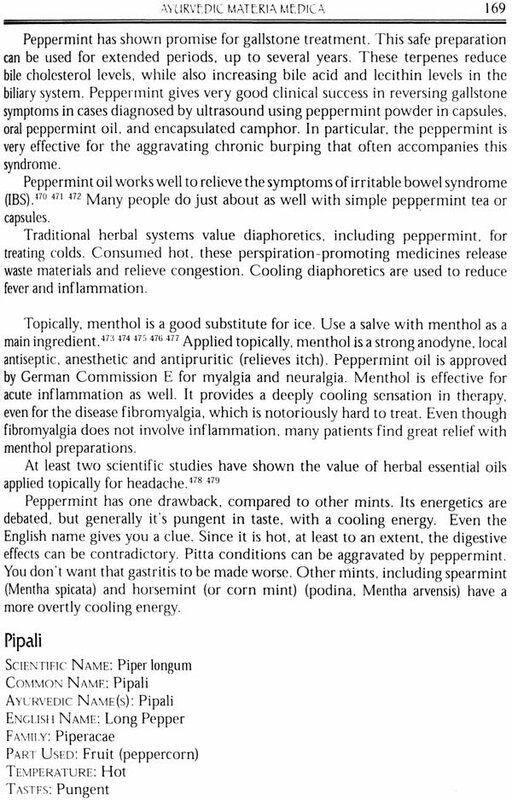 But we also know that the herb tends to increase body temperature- it is "hypermetabolic, or "hot." lf the patient has a fever, or is a person who is particularly prone to develop inflammation (heat) that is difficult to control, we would think twice about using that specific herb. It might kill the bacterium very nicely, and treat the infection, but the whole person would be worse off as a net total than before we started. Instead, we would seek out an herb that would kill the infection, but which had a "cooling" energy. This difference in approach can make a world of difference in clinical practice, and gives us an invaluable tool in managing a case for the best in the long term, and in treating the person as a whole human being. We don’t want to make people worse while we think they are getting better. Using an energetic model, the properties of foods and herbs are collated systematically according to their taste, temperature, effect before and after digestion, and similar factors. While the modern method of nutrient analysis is to isolate and identify key active ingredients, which is incredibly complicated, and is far from complete, considering how recent the effort is, the art and science of energetics creates an impression from the whole, allowing us to grasp the overall nature of the remedy, and predict with great accuracy the expected consequences of its use. Using a system of energetics allows the practitioner to match the actions and nature of the medicine to the individual patient. This categorization of the individual by energies is often referred to as "differential diagnosis? This term means something different than in conventional medicine. Rather than applying this process to diseases, to differentiate one from another, facilitating proper diagnosis, energetic systems understand this concept to mean the differentiation between individuals, all of whom might have the same diagnosis in the conventional sense. Line up ten patients with multiple sclerosis or chronic fatigue syndrome or pneumonia. Each of the patients in any group will have characteristics in common, but each case will be as unique as the person manifesting the disease. 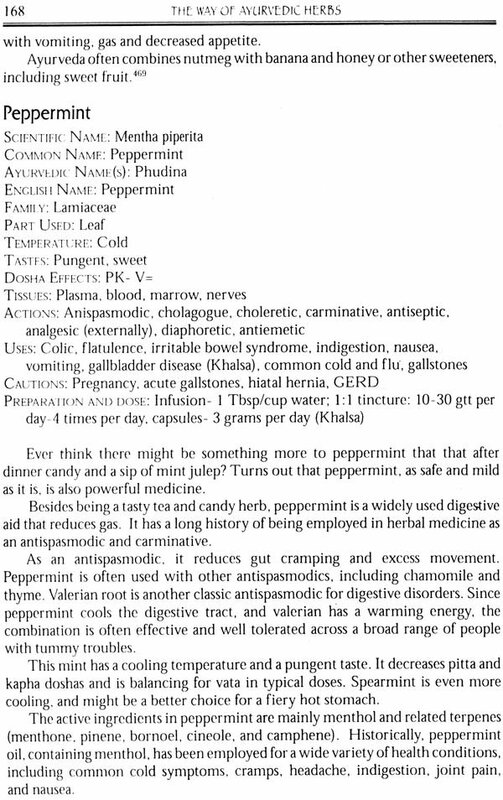 An herbalist using an energetic paradigm will choose the herbal prescription based on the uniqueness of the case, rather than the commonality of the medical diagnosis. 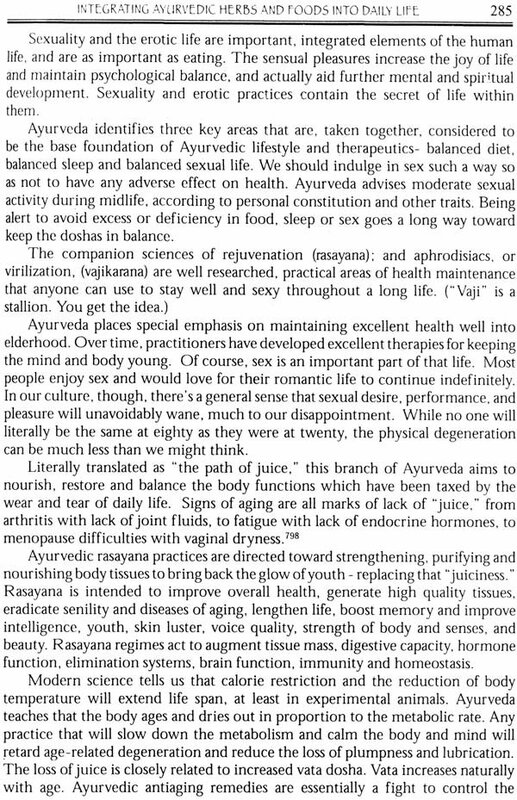 Ashwaganda for stamina and vitality…. Arjuna for the health… dandelion for breast wellness… gokshura to reach a sexual peak… Traditional Ayurveda, using the principles of the three doshas, constitutional body type and highly individualized therapies, is the oldest continuously practiced healing system on Earth. Over those many centuries, generations of Ayurvedic scholars and physicians have reviewed, inspected, dissected and refined the system to perfect a highly effective form of health, balance and healing. Now, two of the world’s leading Ayurvedic herbalists, both leaders of the holistic health renaissance, and who, together, bring a total of over 75 years of practice to the work, have crafted a manual for making Ayurveda understandable and eminently, practically useful. 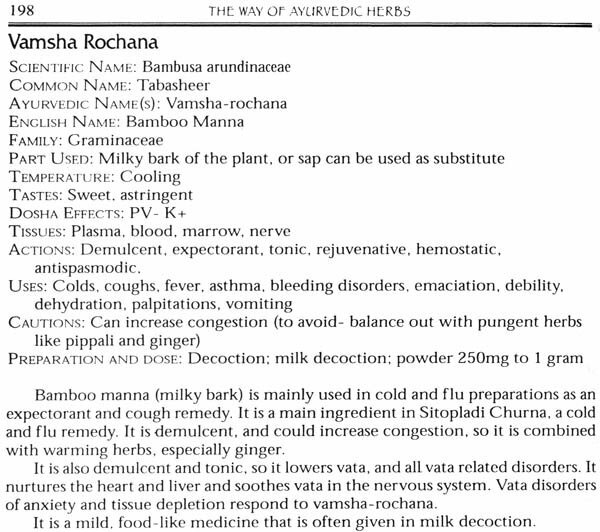 The Way of Ayurvedic Herbs is more than an herb manual. It is a life path to well-being.